Sonia had suggested that another photograph could have been used as the cover picture. The photograph showed Rahul with a group of rural women. 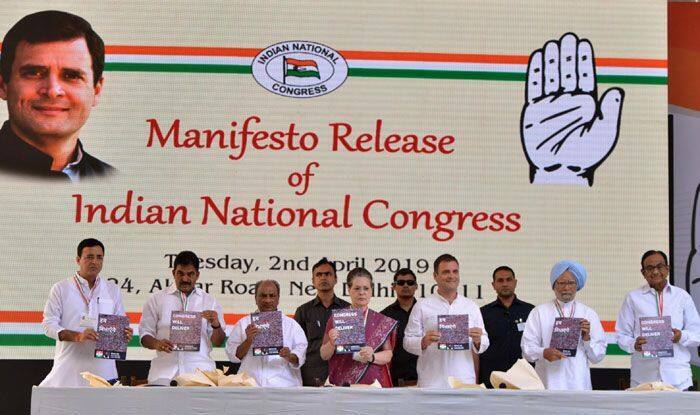 New Delhi: The Congress manifesto was released a day ago. While the party spoke in one voice enumerating the party’s vision, there was one thing the uP chairman, Sonia Gandhi, wasn’t happy with. She had a problem with the colour scheme of the election manifesto booklet. WION reports that Sonia even spoke to Congress research department head Rajeev Gowda right before the function. She wanted the manifesto in some lighter colours instead of the dark ones which were eventually picked. Gowda confirmed he had a conversation with Sonia along these lines. “We did not put leaders’ face on the manifesto because we wanted to put people on the cover. This cover is a departure from the past and decision was reached after many rounds of meetings which included senior leaders like Sam Pitroda,” he said. After going through the manifesto, Sonia had suggested that another photograph could have been used as the cover picture. The photograph showed Congress President Rahul Gandhi sitting with a group of rural women with ghoonghat (veil). However, party sources told WION that that photo was dropped because it could’ve conveyed the wrong message. “The picture looked very good in the context of colour scheme but women were in ghooghat and we were against putting this photo on the front page,” a source said. He said that the manifesto showcases a modern approach. Former finance minister P Chidambaram is the chairman of the manifesto committee. The manifesto was released by party President Rahul Gandhi and comes with a tagline “Congress Will Deliver”. It promises jobs, relief from farm distress, a single moderate rate of GST and Rs 72,000 per annum to poor families if the grand old party comes to power in the Lok Sabha polls.